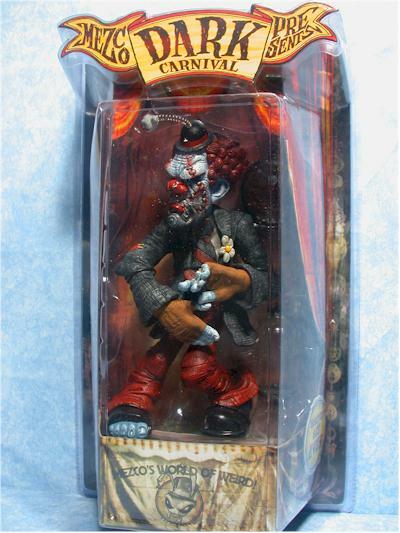 The latest unique creation from the wacky folks at Mezco is now hitting retailers - Dark Carnival! 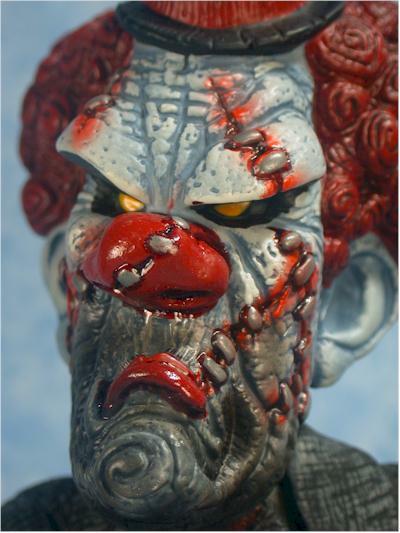 A big hit at last year's Toy Fair, these large (8"-9"), hollow, articulated figures remind us all that there's a damn good reason Kramer is afraid of clowns. The series includes three single packed figures - Cadaver the clown, Stitches the clown (reviewed tonight), and The Browning Brothers (reviewed at Poop Shoot). There's also a large deluxe figure of Madame Mortuus, a talking fortune teller. The regular figures retail for around $15 each, while the deluxe figure runs $20 - $25, depending on the retailer. I'm not sure if we'll see these at bricks and mortar stores, although the Musicland family (Sam Goody, Media Play, Musicland) are possible. They carried the Mezco Animal House figures, and these are very similar in style, although without a license behind them. 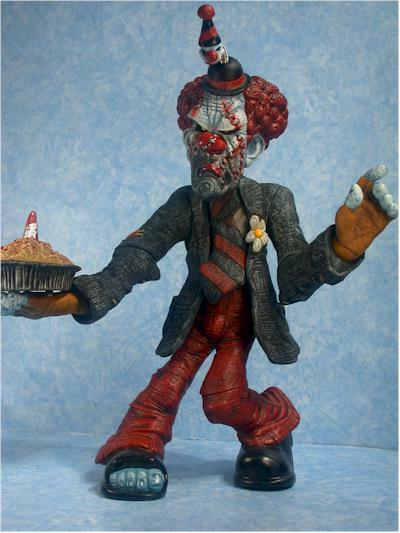 Stitches the clown is more than just an action figure, more than a psychotic urban vinyl funny man - he's also a bobble head! That was a big surprise to me, as I hadn't seen it mentioned any where. That adds a little to the uniqueness of this character. The graphics and style of the packaging is top notch. This isn't just a clamshell - it's art. You get the impression of the old carny, with just the right amount of something wicked this way comes thrown in. It's designed to appear as though the figure is on an old wooden stage, with an appropriately unsettling curtained backdrop. The package is going to take up a lot of space, and not be all that easy to store, but it looks excellent, and is right up there with some of the best work this year. Considering that much of this figure is hollow, the sculpt is very detailed. Normally, only injection molded components manage to attain this level of detail, but the new manufacturing processes are giving new life to an old technology. Everything from the clothes to the hair has every little wrinkle, every little fiber, and by giving the various pieces slightly different textures, they give the impression of different materials. The body sculpt gives Stitches a slightly awkward pose. The odd leg positioning somewhat detracts from his overall ominous appearance, and makes him look a tad goofy. But he does stand easily on his own, thanks to his big feet. The head sculpt is particularly good, with the right amount of gruesome thrown in. This is a clown that would give any kid nightmares for years to come. The paint ops on Stitch, uh, I mean Stitches (don't want Disney getting confused) are far superior to the other figure in the series I reviewed, The Browning Brothers. Here, there's tons of color, and the wash used to bring out the fiber details works great. I was very impressed with the paint used for the eyes - it reflects the light and gives them an eerie, glowing appearance. There's a little slop here and there, but with a figure like this, it can even look intentional. They've done a great job picking the palette of colors, and did a nice job with the application. The articulation is adequate, but not stupendous. It's just about what you'd expect though, and there are no big surprises. Stitches has shoulder, elbow, wrist, waist and knees. It's enough to make him stand easily, and give him a few good arm poses, particularly with the accessories. He doesn't have neck, a result of the bobble head feature. 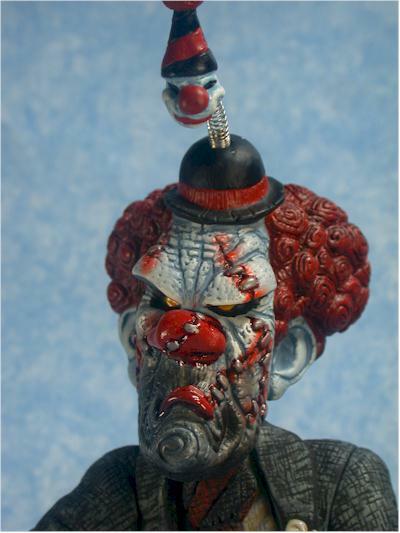 The bobbling works well though, and the little clown head springing out of his hat bops around nicely. There are three distinct accessories with Stitches - his seltzer bottle, nasty cream pie (with spike jutting out), and a small circus-style poster showing his picture. 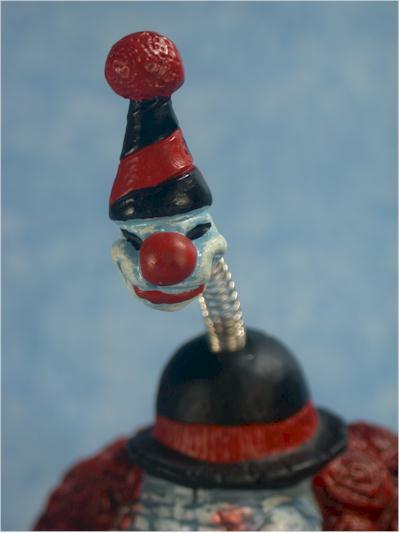 The bottle and pie both have pegs on the back side that can be inserted into a hole in his right hand. That makes holding the accessories a snap, and a nice touch on Mezco's part. While not as light in this department as The Browning Brothers, it's still not fantastic. Sorry, but $15 is too much to pay for these. If you shop around (and I have one suggestion below), you could probably get the whole set for $40 tops, and that adds another half star to this rating. This is almost a ***1/2 star figure. Drop the price five bucks and it would have picked up that extra half star no problem. 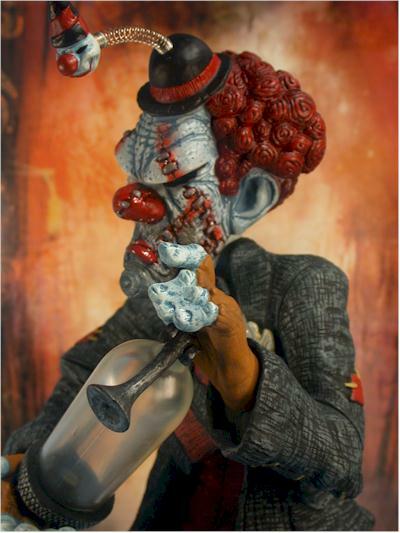 The sculpting is solid, the paint ops are great, and with decent articulation and accessories, he's a great addition to your clowns from Hell display. 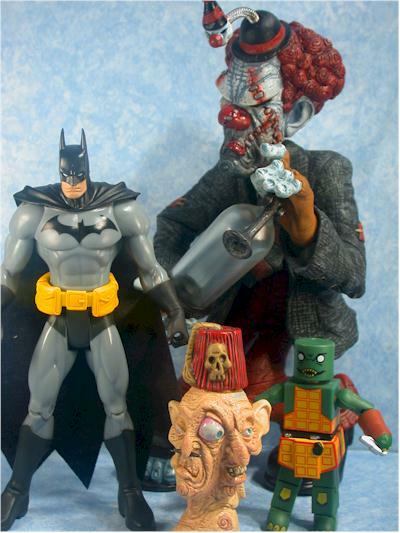 - Killer Toys has them available for $15 individually, or $40 for the set of three, and Madam Mortuus is $20. - Aisle Sniper has them on preorder for $45 for a set of three, and $23 for Madam Mortuus.